Rideau River Biodiversity Project: This was a three-year study started in 1995 by the Regional Municipality of Ottawa-Carleton (as the region was formerly named) joined the Canadian Museum of Nature to determine the quality of the River's water, its microscopic algae, and the spread of zebra mussels (an invading exotic species). As public interest mounted, and thanks to the contributions of various financial partners, the field of study was expanded in 1998 to develop a more complete picture of the Rideau River. Seven areas of study were added: fish, birds, amphibians, reptiles, indigenous freshwater mussels, aquatic invertebrates and aquatic plants. The length of the Rideau River to be studied was stretched from Smiths Falls to the Ottawa River. The Rideau Roundtable grew out of this project and helped establish turtle and fish habitat along the river. They've also help water protection and natural landscaping workshops and promoted natural shoreline best practices which can be found here. I also found this other webpage with great information: Ecology & Fauna of the Rideau (above picture is from their website). The Environment Canada Headquarters building corridor created a courtyard with a unique microclimate. Continuing on from our role in the master landscape planning for this large site, our firm was hired to provide landscape design for the courtyard garden to reflect the sustainable design values of the department and the modern building facades surrounding the courtyard. A strong staggered wiarton black limestone pathway draws one into the courtyard to experience the different elements while creating a sharp contrast to the uniform concrete pavement. 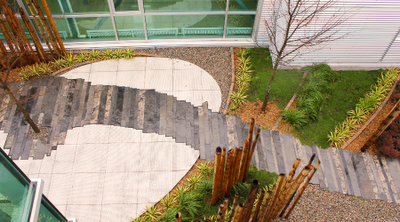 The plant material throughout the site complements the hardscape and provides year round interest with little maintenance. Drainage of the area is to rock sumps to re-charge ground water. Rainbarrel irrigation is planned for the courtyard for seasonal watering, although the garden is designed as a xeriscape landscape. Grassroots Urban Creek Revival: Cordornices Creek daylighting and restoration project began in 1995. 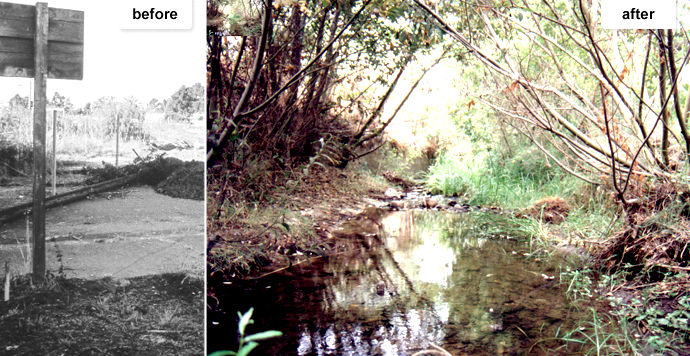 In the first year 375 volunteers contributed to opening the creek and landscaping the restored meander of the water — an important factor in regulating speed and controlling floods — and the area saw a gradual increase in the population of species like crayfish, damselflies, garter snakes, mallards, and egrets. This section of the city was once a little used parking lot, a street that had been closed, a sidewalk, and a flat earth-filled area covered with fennel. The daylighting project was a satisfying collaboration with Urban Creeks Council, who applied for and got $25,000 from the Department of Water Resources Board and hired a semi-volunteer bulldozer operator, who happily volunteered to work for half pay – said he’d never had the chance to “make a creek” before. Volunteers took cuttings from willow trees, cut them into stakes about an inch thick (none thicker), sliced the trunk side of the branch at a sharp angle and the end toward the leaves square, and drove them with a hammer into the banks of the creek. Now we have forty foot high willows and alders. Watercress, cattails, horestails and bulrushes showed up on their own. Along the banks, nasturtiums, wild grapes, mint, chicory and plantain, California glory, ceanothis, native grasses, lupine, red and blue flax, clarcia and the ever present California poppy. Codornices Creek daylighting is a paradise to all sorts of critters: butterflies, dozens of birds, steelhead trout, sticklebacks, crawdads, water snails, frogs, garter snakes, water striders and lots of insects including sulfer-blue damselfies and vermillion dragonflies as brilliantly colored as tiny red flying neon lights. The planting philosophy was to plant natives along with an orchard. Within a few months volunteers had donated fruit trees of all sorts: apples, plums, apricots, figs, oranges, lemons, nectarines, peaches, cherries, persimmons, and Asian pears. 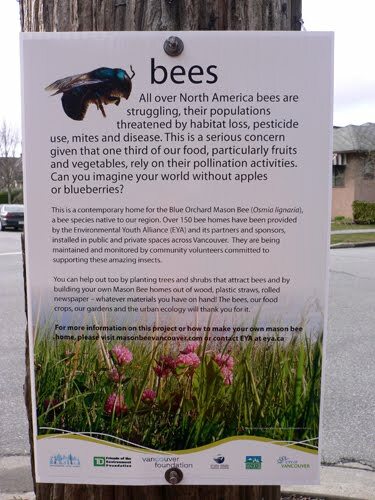 Pollinators Paradise (from the website): With over 150 volunteer 'bee stewards', the project has established 150 mason bee homes and nectar-rich plantings across the City of Vancouver. Volunteers have agreed to maintain and monitor the condos for two years, reporting in on a monthly basis on bee habitation and activity. They have also agreed to not use pesticides in their garden. Funded by Environment Canada's EcoAction Community Funding Program, TD Friends of the Environment Foundation, Canadian Wildlife Federation, and the Vancouver Foundation, the program will run until October 2010. 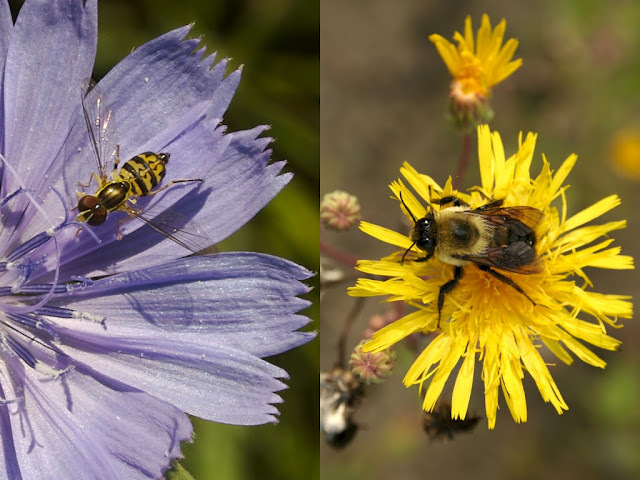 We have chosen to focus our attention on the Blue Orchard Mason Bee (Osmia lignaria), a native bee species that can be used effectively in educational campaigns. They are non-aggressive, propagate easily and are extremely effective pollinators, particularly of apples, cherries, and pears. Urban gardens are a great way to restore habitat, and as a response to this, the Environmental Youth Alliance's is working with the community to, in some small way, help create new habitat for pollinators that is essential to keeping plant communities diverse and productive. 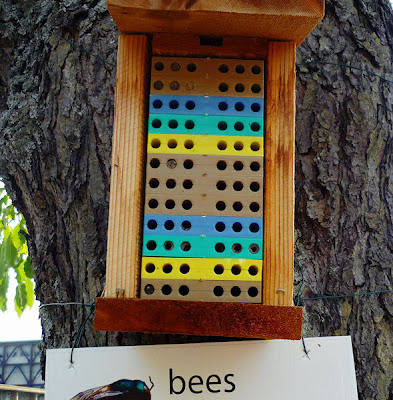 Even some "super lodges" for the mason bees were installed at the following public locations: Stanley Park (Rose Garden Pagoda), Everett Crowley Park (Great Pyramids), Jericho Park (Yaletown) - 53 public condos in total. Britannia (Vancouver) Neighborhood News "Condo Installed in Napier Square Greenway"